Motorcycle Sunglasses were tested by ADS Sports Eyewear to determine which lens colors are the best choice for motorcyclists. Results showed that the riders eye color was as important component in making this determination. Looking through the copper lens on top will provide more contrast and seem brighter. The Grey lens below lets in the same percentage of light but will feel darker. The testers suspected that eye color would determine which lens colors were most comfortable, and which lenses provide the best contrast. This experiment was the first time they could actually measure how true this is. Motorcycle Sunglasses in this experiment had either grey or copper lenses. ADS Sports Eyewear sales show that over 80% of riders wear grey lenses and black frames. 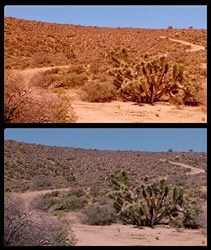 In this experiment each participant rode through the same environment with each lens color. Their goal was to determine if either lens color helped the rider evaluate road textures or recognize subtle hazards in the road. While the goal of this experiment was to identify a specific lens color that should be worn by motorcyclists the end results illustrated why motorcyclists have more than one lens option when they shop for motorcycle glasses. Prescription Motorcycle Sunglasses were included in this evaluation, but this did not appear to have any impact on the final results. It was obvious early on in this testing that eye color was an important component in determining which lens colors were most comfortable, and which lenses provide the best contrast. This experiment provided the first opportunity to actually measure how true this phenomenon is. Medically this could be explained by the fact that lighter colored eyes like light blue, green or hazel are more transparent and therefore more inclined to be sensitive to bright light. Contrast lenses will make the world seem brighter. This is true even when a contrast lens like a 12% copper or brown lens is compared to a 12% grey lens. Both lenses let in the same 12% of light, but the contrast lens will feel much brighter. This perceived brightness is neither needed or welcome for riders who are light sensitive. -About 85% of riders with Blue, Green or Hazel Eyed were infinitely more comfortable wearing a grey polarized lens. A couple riders with very light colored eyes returned the glasses with copper lenses to the testers within seconds. Their reaction to trying on a copper lens was something like, “WHOA . . .way too bright”. These riders felt that they were more relaxed with a grey lens, therefore they would be able to stay in the saddle longer. -Almost every one of the Brown Eyed participants stated that they had better depth perception and could see more detail when wearing a copper or brown lens as compared to a grey lens. For most of these riders the additional contrast was considered safer and more comfortable. Even though riders in this group universally thought the contrast lenses provided better vision, some riders still preferred the true color of a grey lens. Testing for polarization started with a longstanding belief that polarization could make it more difficult to recognize a puddle in the road because polarization will eliminate the glare from the water. This belief dominates many old-school motorcycle organizations, but these testers were unable to create any situation where this theory was valid. Glare made it difficult to see anything around the water. Polarization allowed the rider to see what was in the puddle and recognize the difference between a puddle and a pothole. The general consensus was that if a rider needed glare tell the difference between pavement and water they were a good candidate for prescription motorcycle glasses. ADS Sports Eyewear has specialized in motorcycle sunglasses and prescription sports eyewear for the past decade. All motorcycle eyewear from ADS Sports Eyewear blocks 100% of UV light and passes ANSI Safety Standards. Much of their inventory is available on their web site at http://www.ADSEyewear.com .